I won’t lie and say this will be my one and only post about the election. If you’re my friend on Facebook then you probably just laughed at that first sentence. If you’re my friend in real life then you definitely fell off your seat in hysterics. I’m not interested in debating politics, the electoral college, candidates, or platforms. I’m not interested in who you voted for and I’m not going to announce who I voted for. That part is over. What I’m talking about, what is causing my heart to ache, what is flying around my head faster than my hands can type is the aftermath. What happens now. Tuesday night a large portion of our country sat in disbelief, shock. Wednesday night a large portion of our country fumed in anger. And now on Thursday, I see an enormous portion of our country even more divided than they were on Monday. Relationships that made it all the way through the particularly vicious election cycle are crumbling. Respectable people resorting to name-calling. Hurting people being dismissed, innocent people being accused and attacked. The numbers don’t lie: our country is deeply divided. The arguments, words, fights, even violence that have erupted in the wake of our election are a more painful illustration of it. But what few are realizing in their zeal to defend their vote is that either way we would be having these arguments. No matter which candidate won, our country was not going to be healed by the declaration of one person’s name. Racism has been alive in our country for centuries. Sexism has been a problem always. 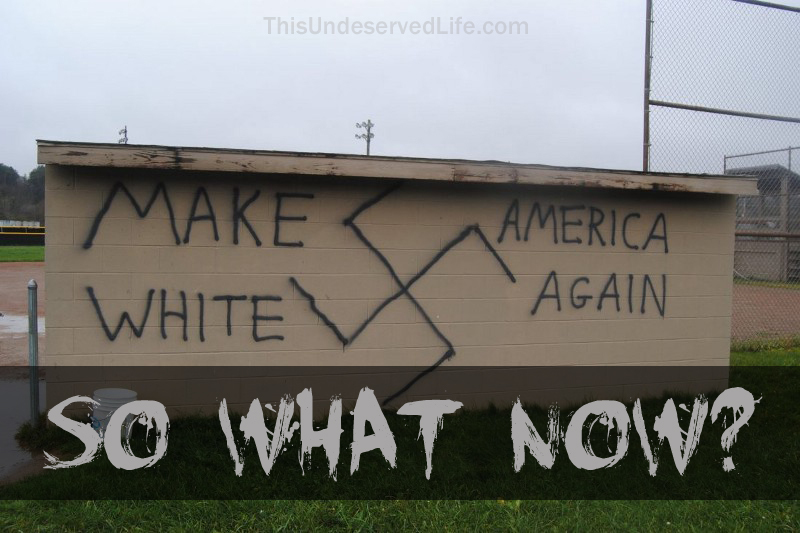 In my white suburban bubble I was able to believe that racism really wasn’t around anymore, but after 8 years with a black president, countless terrorist attacks, and to be honest, a lifetime of living in a border state, I’ve had to admit something ugly: racism is very much alive. As a woman, well, I’ll tell you that I never doubted gender inequality and misogyny. Racism and sexism do not happen overnight. Ableism does not happen overnight. Phobias and hatred are not formed overnight. And they are not cured overnight. No matter whose name was announced as our next president, these things were not going to disappear. One leader does not make those kinds of changes. WE DO. We the people, we speak up. We the people, we defend. We the people, we make change. If we are willing to defend our vote then we must be willing to defend each other. We have to use the same determination we had walking into the polling booth to walk up to a bully and say “no more”. We have to have the same fire within us in person as we do on social media. It’s a huge responsibility, change. These cancers did not pop up because of a candidate and a president will not be the one on the ground to treat them. It’s up to us, regardless of who we voted for, of who we have in charge, the responsibility has not changed: we have to make this country better. Our job would be no different today with a different president. Our job today is the same as it was Monday, as it was in 2012, 2008, 1980, and before. A different president-elect would not lessen our burden to effect change around us. So I beg of you, friends, accept your responsibility. My conservative friends, people are genuinely afraid, genuinely hurting, and just because you don’t understand or agree with it doesn’t make it any less real. My liberal friends, all hope is not lost and the country is not as hateful as you fear – someone’s vote is not all there is to them and is rarely about what you may think. My white friends, we have the opportunity every day to listen, extend a bridge, and stand up for those who don’t look like us. My friends of color, I can never pretend to imagine how you’re feeling, but I can tell you that you have allies and support, more than you may feel you have right now. This is not intended to bash or endorse either candidate. This is my first election cycle I’ve experienced without having loyalty a political party, and it’s been awkward to say the least. I’ve mourned, grieved for our country, for months, as someone in between all the screams and ideas and anger and pain I have no answer but love. With feet in all political camps I can tell you that there is no one answer, there is no one candidate who would leave everyone pleased, there is no one person who will unite us. Fiscal policy, foreign policy, education policy, healthcare policy, guns, abortion, marijuana, religion, race, gender, rights…. we will never all agree on all of these issues, but we are all capable of love. We can listen with love rather than listen with comebacks. We can attempt empathy. We can quiet ourselves long enough to hear the other. We can not allow ourselves to stereotype or generalize or name-call. We can approach one another with love and correct to teach, not to win. We can make change happen. Our job remains the same, regardless of the winner, regardless of our skin color, regardless of our religion, socioeconomic status, gender, or political beliefs. Our job is to rid our country of hatred. It has always been our job, and hopefully someday we’ll work ourselves out of it. Hopefully we’ll be so good at our jobs that our kids won’t have to inherit them. Let’s stop putting our blame and our hopes into a candidate and accept our own responsibility to make this a better place. Sexism was not going to disappear if a woman were chosen as our president. Racism did not disappear when a black man was chosen as our president. Ableism is only JUST becoming recognized. There’s a quote that is sometimes attributed to Benjamin Franklin: “The US Constitution doesn’t guarantee happiness, only the pursuit of it. You have to catch up with it yourself.” We the people have a lot of work to do, and the sooner we stop fighting with each other, the sooner we can get started.